Preheat oven to 170C. Mix flour, cocoa, baking powder + soda, brown sugar if using, coffee, and salt together in a large bowl. In a medium sized bowl combine applesauce, silan, and vanilla until thoroughly combined. Pour the wet into the dry and mix [by hand] until combined. Make sure to scrape the bottom of the bowl but do not over mix. The batter will be somewhat lumpy. Let rest for a few minutes [it will become a bit foamy] and then mix in chocolate chips. Pour + spread evenly into an oiled square pan. Bake for 20 minutes until edges pull away from the pan or toothpick test comes out clean. This recipe made 20 big brownies. There are 4 people living in this house. I made the brownies less than 24 hours ago and they are GONE. Two recipes for you today! The first is Lemon Coconut Wedges. Are they a bar? a scone? a cracker? a biscotti? A little of all of the above! These are not very sweet, but quite tasty in a healthy, crunchy, bar sort of way. Do not make them expecting a sweet dessert – they are not that. I actually made them to eat as a breakfast for days I am must dash out in a hurry and have no time for my standard oatmeal. Lightly oil an 8-inch round cake pan and preheat oven to 300F / 150C. Mix together and set aside for 10 minutes to turn into a gel. Mix the above dry ingredients together and set aside. Mix the above wet ingredients and then mix with the dry ingredients and stir in the chia/lemon mixture. Press with wet hands into the cake pan until evenly distributed and flat. Sprinkle with additional coconut if you want. Bake for 20 minutes until lightly brown and firm. Cut into wedges when cool. This recipe is in the book, The Engine 2 Diet, but it can also be found posted online by the author, so I don’t have any problem posting it for you here. These are GOOD! Measurements are a bit vague and I guessed ie what a “can of black beans and a can of tomatoes” was. I cooked my own black beans, so I’d say it was about 1 1/2- 2 cups cooked. Process everything except the oats in a food processor. Stir in the oats. Form into patties and either bake in a 450F / 230C oven on a greased cookie sheet for 5-8 minutes on each side, or fry in a frying pan (as I did). Enjoy all the link love in today’s post! A couple of weeks ago I was the guest nutrition expert for the Bracha organization at the Raanana Breast Cancer Prevention Walk. Bracha is an organization educating and supporting women about the BRCA gene mutation that can cause genetic cancers, especially of the reproductive organs. If you have a mother or sister who has had breast cancer, you probably want to educate yourself about this issue. I know it’s scary to find out you carry such a genetic problem and it would be far easier to bury your head in the sand, but knowledge in this care could literally save your life. You can find info on Bracha in Israel here. International readers, here is your link. The Bracha organizers asked that I focus on nutrition and lifestyle tips for strong bones, as women who have their reproductive organs removed or damaged during cancer prevention or treatment, are often thrust into quite premature menopause. So I gave out a tip sheet on bone building and a chart with calcium levels in many, many foods (such as the figs, poppy seeds and tahina in the below recipe), recipes including calcium-rich ingredients and of course, food samples! 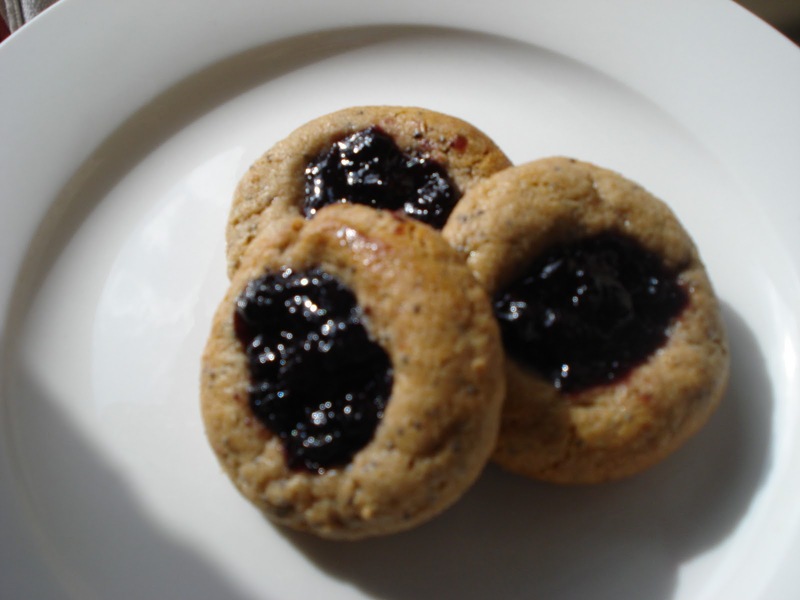 One of the recipes I created for this event is these calcium-rich, sugar-free, VEGAN tahina cookies. The recipe below calls for a fig-filling which is delicious and high in precious calcium. But for this batch in the photo which I made for my own dry-fig hatin’ family, I filled them with all-fruit (no-sugar) blueberry jam. Put figs and water in a small saucepan and heat over medium heat 5-10 minutes until the figs are soft and the water absorbed. Set aside to cool. Preheat oven to 180C. Combine all ingredients (except figs, which are cooling) in a large bowl. Puree figs in food processor until a smooth paste. Roll dough into walnut-sized balls and place on a ungreased baking sheet. Stick your finger in the middle of each ball to make a little indentation. Fill the indentations with about 1 tsp fig puree. Bake 10-12 minutes. Cool on a rack. Enjoy! Next, I wanted to take a minute to tell my blog readers about a special I am running. You all know by now that as a Health & Nutrition Coach, I work with clients on creating and implementing healthier habits. My specialty is permanent weight loss, but I also work with specific health issues and even just with people who’d like to adopt healthier habits for themselves and their families. Some of the issues we cover, aside from the food stuff, is stress reduction methods, relationship issues, career counseling, personal and spiritual growth… obviously not just food and cooking! In the past, the first trial session was the same price as any session, 200nis / hour ($100/hour for International clients). But now I am going to try something new: I am now offering a 20-minute introductory phone or Skype session for FREE! This will give folks a totally free and convenient way of meeting me and hearing if my approach is right for them. Again, please know that I work with clients here in Kfar Saba, face-to-face, but I also have a growing number of phone or Skype clients both here in Israel and abroad. I’ve got clients all over the United States! It’s pretty cool. But it also enables folks who are really busy and not able to schelp over here to KS, to work with me the exact same way in-person clients do. If you are interested email me at Emily@TriumphWellness.com and we’ll set up your 20-minute phone trial session. Better health and happiness could be just a phone call away!